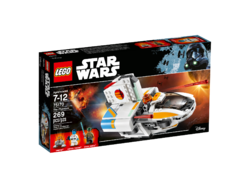 75170 The Phantom is a Star Wars Rebels set released in December 2016. Join the Rebel battle aboard The Phantom! 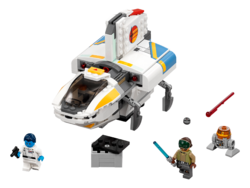 Outrun Admiral Thrawn with the Rebel starfighter, The Phantom, featuring retracting landing gear, an opening minifigure cockpit that detaches in an emergency, dual spring-loaded shooters, an opening rear compartment with included storage box containing detonator, and space beside the cockpit for Kanan’s friendly Astromech Droid, Chopper. 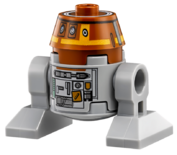 Includes two minifigures and a droid. Includes Kanan and Admiral Thrawn minifigures, plus a Chopper droid. Features retracting landing gear, detachable and opening minifigure cockpit, dual spring-loaded shooters, opening rear compartment with space for the included storage box, and space to attach Chopper. Detach the cockpit and make an emergency escape. Lower the rear hatch to access the detonator store. 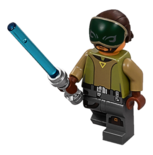 Weapons include Kanan's Lightsaber and Admiral Thrawn's blaster pistol. Measures over 4” (11cm) high, 6” (17cm) long and 3” (10cm) wide. Facts about "75170 The Phantom"